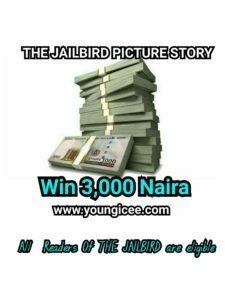 We introduced a new story – THE JAILBIRD – which starts this coming week and we’ve decided to organize a contest where you can win 3,000 naira for telling a short beautiful story from pictures. Pictures which will describe scenes similar to some scenes in the story (the pictures would not describe the story itself) would be posted sometime next week, and from the pictures, we expect you to make out your own story not less than 300 words. Your story does not have to relate with THE JAILBIRD but with the pictures. To participate, you must be an active reader of the story THE JAILBIRD. By active reader, I mean someone who reads and leaves his/her comments. I’m posting this now so that you can start following the story when it starts on Monday. HOW THE WINNER WOULD BE DECIDED. Hmmm if i no follow, who will? Fire on pls. I'll participate in the contest, but please are all the pictures needed to compile our short stories gonna be posted on a day? let’s get dis party started…. right!